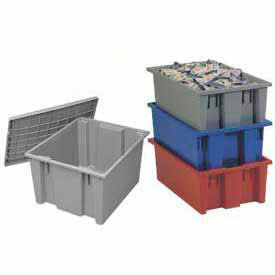 Corrugated Plastic Nesting Totes - Lightweight, yet Tough, Easy to Clean. Nests for Space Saving! 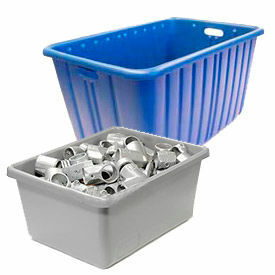 Corrugated Plastic Totes feature sonic welded seams and steel rod reinforced at the top for added strength and rigidity. Easy to clean, resistant to dirt, moisture and grease. Convenient hand holes for easy carrying. Nests for space saving storage. The Mail Tote meets US Postal Service requirements. 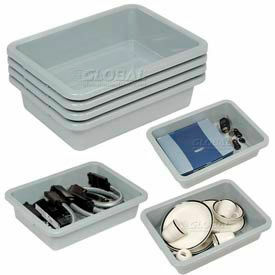 Measures 18-1/2"L x 13-1/4"W x 12"H. Lid protects contents from damage and dust. Add color suffix when ordering Blue(BL), Red(RD) or Yellow (YL). Corrugated Plastic Mail Tray features folded, doubled sidewall construction. Nest together to save space. White color only. Measures 24-1/2"L x 12"W x 4-1/2"H.
Rubbermaid Plastic Storage Boxes Are Industrial Grade Containers For Food Service And Other Storage Applications. Rubbermaid Plastic Storage Boxes are available in clear polycarbonate or white polyethylene, ensuring safe use in dishwashers and freezers. Plastic storage box sizes are compatible with industry standard shelf and counter dimensions. 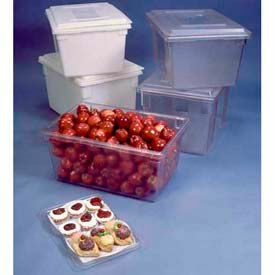 Rubbermaid Plastic Storage Boxes meet NSF Standard #2, USDA Meat and Poultry standards and are FDA and HACCP compliant. Sold in case quantities of 6. Available in a variety of sizes with capacities of up to 21-1/2 gallons. Lids are sold separately. 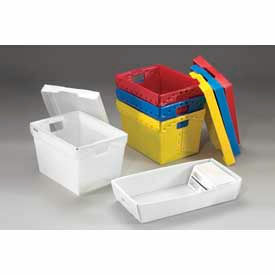 Rubbermaid Nesting Totes, Bus Totes feature easy-to-clean walls and rounded corners. NSF approval. 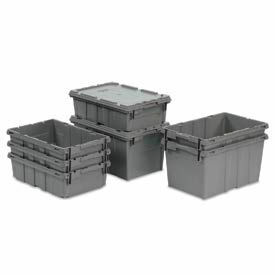 These durable gray polyethylene totes will last for years and provide excellent service for storing a wide range of items. Reinforced handles, bottoms and ribs provide structural support for heavy loads. Feature easy-to-clean walls and rounded corners. NSF approval. Commerical dishwasher safe. Totes can be stacked with lids or nested without for convenient space saving. 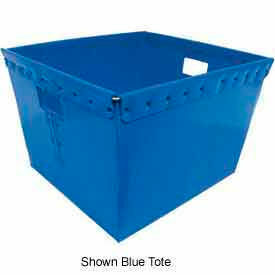 Nesting Tote Is Used For Transporting Large Quantities Of Small Items And Materials. Can be used as a bus box in restaurants, on conveyor systems for transporting goods or used in airports and areas with security checks. Conveniently stores personal belongings to pass security areas. Durable gray polyethylene tote is corrosion resistant. Provides excellent service for storing a wide range of items. Tote is nestable when not in use for convenient space saving storage. Measures 20-1/4"W x 15-1/4"D x 5"H.
FDA-Approved Food-Grade Nesting Tubs Are Used Storage Bins, Totes And Containers For Small Parts, Components, Food And Recyclables. FDA-Approved Food-Grade Nesting Tubs are made of high-density polyethylene plastic for long lasting durability. Features a nesting design for easy storage and portability. FDA-approved nesting tubs have rolled top rim handles for greater comfort while lifting. Storage bins have rounded corners that provided enhanced strength and support for added safety and protection. Bins, totes and containers are easy to clean. Nesting tubs are assembled. Rust and mold-resistant. Colors are Blue or Gray. 24-1/2 inch L x 19 inch W x 9-1/2 inch H. Package quantity is 6. 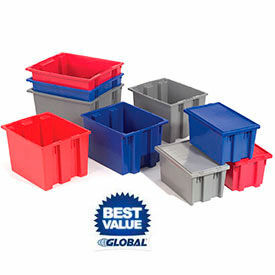 Nesting Tote Boxes efficiently serve for every type of material handling applications. Superior, efficient material handling box. Virtually indestructible...will not rust, chip, flake or corrode. Non-toxic and non-abrasive polyethylene resists most acids and solvents. Perfect for applications ranging from conveyor and storage to inventory control. 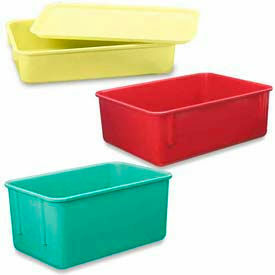 Fiberglass Bus Pans Are Used For Bussing Or Food Storage In A Variety Of Environments. Fiberglass pans are made with positive hand grips and rounded edges for easy handling. Deep and durable pans wont sag when loaded and are dishwasher safe. Bus pans withstand temperatures from -30 to 300°F. LEWISBins+ Plexton® Fiberglass Nest Only Containers Are Used For Storing, Moving And Shipping Small Parts And Use In Autoclaves, Healthcare And X-ray/Security Applications. LEWISBins+ Plexton® Fiberglass Nest Only Containers are made of fiberglass-reinforced polyester for long lasting durability. Thin-wall design offers maximum strength while remaining lightweight. Accommodates extreme temperature ranges, provides high weight capacity and when empty efficiently nest or stack with covers. Covers sold separately and can be used as trays. Many options and accessories are available. Colors are Blue, Gray, Green, Red and Yellow. Package quantities are 10, 16, 22 and 48. Available in a variety of outer and inner dimensions to meet job specifications. 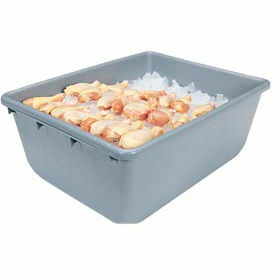 The FDA and USDA Approved Totes Are Designed Specifically For Food-Handling And Processing. All containers are constructed of sturdy, nature white, high-density polyethylene plastic and are USDA approved. The totes are easy to clean and resistant to extreme temperature. Polyethylene plastic containers withstands temperatures from -100 degree to 190 degree Fahrenheit. Add option Lid protects contents and option Spacer Tray to prevent the load from shifting in transit. Certwood Plastic Totes And Rollatray Kits Provide Storage Organization And Mobility For Applications Including Commercial, Industrial, Mechanical And More. Certwood plastic totes and rollatray kits are made of ABS or polystyrene for long lasting durability and corrosion resistance. 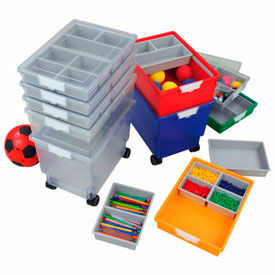 Includes modular storage tote trays and various lid sizes for application versatility. Features smooth internal surface for easy maintenance and dual labeling system for convenient inventory control. Types are Double Depth, Quad Depth, Single Depth and Storsystem Tote Tray Mobile Combo Kit. Styles include Extra Wide and Standard Width. Package quantities are 1, 5 and 10. Colors are Blue, Clear, Green, Light Gray, Red and Yellow. Dimensions vary per model. Minnesota Diversified Corrugated Plastic Nestable Totes Are Used Storage Bins And Containers For Storing And Transporting Mail, Components And Other Various Items. Minnesota Diversified Corrugated Plastic Nestable Totes are made of high-density polyethylene plastic for long lasting durability. Features a nesting design for easy storage and portability. Storage containers are lightweight for enhanced versatility. Nestable corrugated or straight wall construction provides added strength and support. Reinforced rim for greater stability. Bins, totes and containers are easy to clean. Assembled for ease of use. Nesting totes are available in a variety of colors. Dimensions and package quantities vary per model.